June the 9th is International Archives Day, designated by the International Council on Archives (ICA). 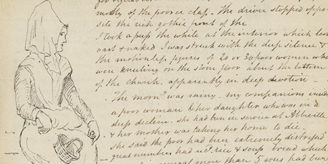 Of course, archives are everywhere: wherever there is writing, there are people using it to document their activities. Less obvious, perhaps, is the global span of the archives held at the Wellcome Library. It is, however, a sad truth that wherever human beings go, disease and injury follows them, so the medical profession is needed everywhere, and as the European powers expanded across the world in previous centuries medical men and women followed, noting their impressions. 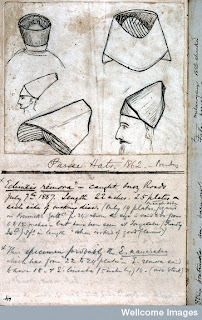 Below are a few samples from the Wellcome Library holdings of archives generated in far corners of the world during the nineteenth century, the tip of an iceberg. 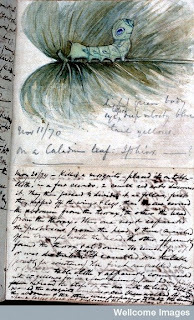 John Temperley Gray (1835-1892), a ship’s surgeon for P&O, between 1862 and 1888 filled a volume (MS.5875) with notes on local wildlife (including beautiful coloured pictures of snakes, birds and a caterpillar), the population of Bombay (inter alia, sketching the various characteristic types of hat worn by the Parsees), local customs such as the different child-birth practices of various religious communities, local songs (which he transcribes with musical notation) and a whole gallery of other subjects, as well as the notes on scientific subjects and the French lessons with which, presumably, he sought to fill productively the long hours at sea. This is, of course, only a tiny sample of the international content of the Wellcome Library’s holdings of archives and manuscripts. 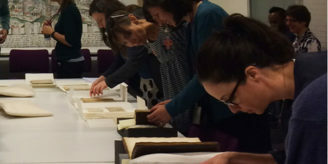 Sources guides on the Library website provide a route into various geographic areas, and the collection as a whole can also be searched for particular place-names or any other words via the online archives catalogue.